Third up is the Radeon RX 560, and this is a little different than the higher-end cards. Whereas the RX 580 and RX 570 are essentially higher clocked versions of their RX 400 counterparts, RX 560 is a new configuration altogether. AMD never shipped a fully enabled Polaris 11 desktop card in the last year as part of the RX 400 series – though they’ve been showing up in laptops like the MacBook Pro – meaning that AMD had held on to another two CUs that they are finally enabling for the RX 560. As a result this card is gaining more than a clockspeed bump. By the numbers, the additional two CUs give the RX 560 a 14% boost in shader and texture throughput. Coupled with that are some modest clockspeed increases for both the boost clock and the base clock. The boost clock is being bumped up from 1200MHz to 1275MHz (6%) and the base clock from 1090MHz to 1175MHz (8%). Coupled with the increased CU count, and we’re looking at a performance improvement on paper of around 22%. That said, the ROP count isn’t changing, so the actual performance improvement will likely be in the middle of those values. When it comes to memory, AMD has only mentioned 4GB cards thus far. Though given the target market and the fact that the higher-end RX 500 cards are getting mixed configurations, I wouldn’t be too surprised if we see some 2GB cards here as well. AMD has not disclosed the memory clocks, but as RX 460 already shipped with 7Gbps GDDR5, I’m expecting the same here. So memory bandwidth would be identical to RX 460. Things are particularly interesting for power consumption. Whereas the high-end Polaris cards are both seeing their TBPs increase this generation, the RX 560 is covering a wider range. The official TBP is 60 to 80W. AMD’s partners will be releasing both sub-75W versions that don’t require a PCIe power connector, and 75W+ versions that do. We’re told that the 75W+ versions will be the more common of the two. What’s not clear right now is whether the sub-75W models will get the same clocks, as board partners can turn down the power limit without turning down the official clockspeeds, at the cost of increased power throttling. Moving on, unlike the RX 580, RX 570, and RX 550, the RX 560 isn’t launching this week. Rather it’s going to be launching in early May. Prices on these cards will start at $99, which is a good deal lower than where the RX 460 launched at, though consistent with its pricing over the last few months. The competition for the card will be NVIDIA’s GeForce GTX 1050, which is still priced at $109, but is not uncommon to see on sale at $99. The target market for the RX 560 will be lower-end 1080p gaming. It’s not nearly as fast as the RX 570, so that means dialing back on graphics quality a bit to sustain good framerates, but it’s also some $70 cheaper. Last and literally the least is the Radeon RX 550. 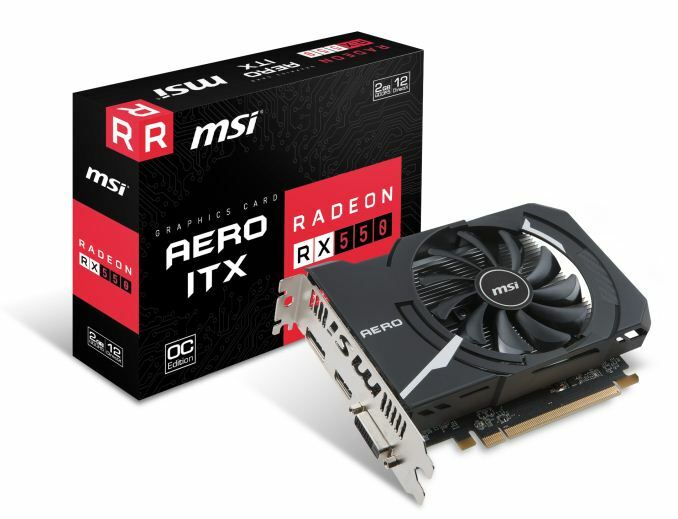 This is a particularly interesting card because it has no Radeon RX 400 series analogue. In fact the GPU it’s based on is brand new; this is the first product to get it. At the heart of the RX 550 is AMD’s new Polaris 12 GPU. This is an even smaller, lower performance, and lower power GPU than Polaris 11. It features just 8 CUs – half as many as Polaris 11 – but a full 128-bit memory bus. Overall Polaris 12 is comprised of 2.2B transistors, coming in at a die size of 101mm2. Interestingly, this is not all that much smaller than Polaris 11; AMD has shaved off just 800M transistors and 22mm2, about 22% of the transistors and 18% of the die area respectively. So AMD is definitely in the area of diminishing returns, as fixed function hardware and interfaces are now taking up a significant fraction of the die area. Polaris 12 comes as a replacement for the equally quirky Oland GPU, which was released all the way back in late 2012 in laptops, and 2013 in desktops as the Radeon R7 250/240. Oland was a cost-optimized GPU for low-end devices, and as a pairing partner for CrossFire with AMD’s APUs. Polaris 12 in turn fills much of this same role. If it’s anything like Oland, Polaris 12 will have other features stripped out (e.g. Oland didn’t have a video decoder), but we don’t have any further details on Polaris 12 at this time. The RX 550 in turn will ship with a Polaris 12 clocked at 1183MHz for the boost clock, while the memory clock is unknown. Practically speaking, I’d expect this to deliver around half the performance of an RX 560, but it may do better than expected depending on the ROP configuration. Unexpectedly, it should be also flush with memory bandwidth. While AMD has not announced the memory clocks, it will have a full 128-bit GDDR5 memory bus. So memory bandwidth could be comparable to RX 560, giving it a lot more bandwidth per FLOP and helping to offset the lack of shader resources. Polaris 12 is primarily destined to live its life in laptops – a similar fate as Polaris 11 – but AMD is starting off with the desktop ahead of a big laptop push later this year. The desktop card will come with 2GB of VRAM and will be priced at $79. This is not a massive amount of savings compared to the $99 RX 560, but then as I’ve stated before, AMD is getting into diminishing returns here. Sub-$100 cards have to give up a lot of performance for a small decrease in price. Unlike the other RX 500 cards, the RX 550 isn’t meant to replace earlier AMD cards. If you have a Radeon R7 250, the odds are your entire system is due for an upgrade. Instead it’s being positioned as a step-up card for system owners looking for something better than an iGPU, but without taking too big of a hit to the pocket book. Practically speaking, the target market for the RX 550 is a mix of entry-level gaming and HTPCs. On the former the card should be a good bit faster than an iGPU and more than suitable for MOBAs and other mass-market games, and in the case of the latter, it’s AMD’s lowest-power card that features both HDMI 2.0 and a video decoder (and even Freesync support). The 50W TBP means that low-profile designs can be offered, making is a good pairing for slim HTPCs. The RX 550 will be launching later this week, on April 20th. Yeah, I don't think the 580 is a very good deal at that price unless you are looking specifically to play the games that the 580 excels at or if you already have a FreeSync monitor. I don't buy into any DX12 performance argument. I think that AotS is probably the only truly DX12 game out there (I could be wrong, but that's my impression). It's an AMD partner game and the 580 and 1060 are still pretty much even in that game. To me there is no reason to believe the "AMD hardware will be better at DX12 games" claim. When developers are experienced with DX12 and games are truly designed and optimized for DX12 from the ground up then we will see how hardware actually performs in DX12.